Ewww! 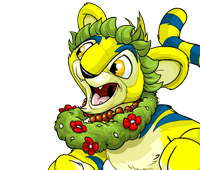 In his quest to trap hapless Neopets and Petpets who venture into the Haunted Woods, Meuka has made a sticky web and strung it between some branches. To make matters worse, his super-sticky mucus is clinging to the web, and if anyone gets caught in one of those green blobs, they'll be stuck for hours! Put an end to Meuka's disgusting plans by blasting those boogers away! Be sure to not run out of mucus, though -- if you do, you'll find yourself in a very sticky situation. Use your mouse and your wit to carefully clear the board of all snot blobs and move on to the next level. Power-ups will be on hand to help if you get stuck, but relying on them to get you out of every jam will only end in misery. You are about to send feedback on Snot Splatter. We would appreciate it if you could give the game a rating out of 10, and also tell us any additional comments you may have. Thank you for your feedback on Snot Splatter.